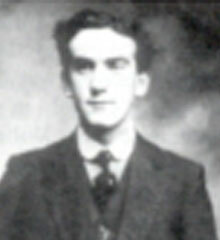 Henry Mitchell Kelly was the youngest son of John and Rebecca (Hadden) Kelly of Mochan, Castlecaulfield, Co. Tyrone. He was born in Castlecaulfield on 19th May 1892. The 1901 census record Mitchell as 10 years old, living with the family at Moghan, Clonavaddy, Tyrone. His family was farmers. The 1911 census shows that Mitchell was no longer living with the family. It’s possible he was 19 and living in Scotch Street in Dungannon, working as a draper.Henry Mitchell Kelly was living in Coleraine when he enlisted. 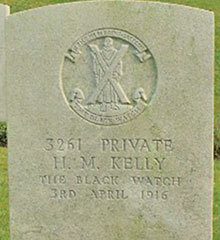 Private Henry Mitchell Kelly was serving with the 1st/6th Battalion of the Black Watch (Royal Highlanders) when he died on 3rd April 1916, age 24.